Charles Barry was an English architect, best known for his role in the rebuilding of the Palace of Westminster (also known as the Houses of Parliament) in London during the mid-19th century, but also responsible for numerous other buildings and gardens. He began designing churches for the Commissioners, and he found out that they preferred designs in Gothic and Greek styles, so he put efforts into building those kinds of churches. His first buildings were in Gothic Revival architecture style, including two in Lancashire, St. Matthew, Campfield, Manchester (1821–22) and All Saints' Church, Whitefield (or Stand) (1822–25). Barry designed three churches for the Commissioners in Islington, all were built during (1826–1828), these were, Holy Trinity, St. John's and St. Paul's, and all are Gothic in style. Two further Gothic churches in Lancashire, not for the Commissioners followed in 1824: Ringley Church, partially rebuilt in 1851-54 and Barry's neglected Welsh Baptist Chapel, on Upper Brook Street (1837–39) in Manchester (and owned by the City Council), is currently open to the elements and at serious risk after its roof was removed in late 2005. One of the first works by which his abilities became generally known was the Gothic St Peter's Church, Brighton (1824–28). His church designs also include one in Hove, East Sussex St Andrew's in Waterloo Street, Brunswick, (1827–28); the plan of the building is in line with Georgian architecture, though stylistically the Italianate style was used, the only classical church Barry designed. The Gothic Hurstpierpoint church (1843–45), with its tower and spire, unlike his earlier churches this was much closer to the Cambridge Camden Society's approach to church design. According to the his son Alfred, Barry later disowned these early church designs of the 1820s and wished he could destroy them. His first major civil commission came when he won a competition to design the new Royal Manchester Institution (1824–35) for the promotion of Literature, Science & Arts (now part of the Manchester Art Gallery), in Greek revival style, the only public building by Barry in that style. Also in north-west England, he designed Buile Hill House (1825) in Salford this is the only known house where Barry used Greek revival architecture. The Royal Sussex County Hospital was erected to Barry's design (1828) in a very plain classical style. Thomas Attree's villa, the only one to built of a series of villa's designed for the area by Barry and the Pepper Pot, whose original function was a water tower, Queen's Park, Brighton (1830). The marked preference for Italian architecture, which he acquired during his travels showed itself in various important undertakings of his earlier years, the first significant example being the Travellers Club, in Pall Mall, built in 1832, as with all his urban commissions in this style the design was astylar. He designed the Gothic King Edward's School, New Street, Birmingham (1833–37), demolished 1936. His last work in Manchester was the Italianate Manchester Athenaeum (1837–39), this is now part of Manchester Art Gallery. From (1835–37) he rebuilt Royal College of Surgeons of England, in Lincoln's Inn Fields, Westminster, he preserved the Ionic portico from the earlier building (1806–13) designed by George Dance the Younger, the building has been further extended (1887–88) and (1937). In 1837 he won the competition to design the Reform Club, Pall Mall, London, this is one of his finest Italianate public buildings, notable for its double height central saloon with glazed roof, his favourite building in Rome, the Farnese Palace influenced the design. A major focus of his career was the remodelling of older country houses, his first major commission was the transformation of Henry Holland's Trentham Hall, Staffordshire (1834–40) it was remodelled in the Italianate style with a large tower (a feature Barry often included in his country houses), Barry also designed the Italianate gardens, with parterres and fountains, largely demolished in 1912, only a small portion of the house consisting of the porte-cochère, with a curving corridor and the stables are still standing, although the gardens are undergoing a restoration, additionally the belvedere from the top of the tower survives as a folly at Sandon Hall. At Bowood House, Wiltshire, (1834–38), for Henry Petty-Fitzmaurice, 3rd Marquess of Lansdowne he added the tower, made alterations to the gardens and designed the Italianate entrance lodge, also for the same client he designed the Lansdowne Monument(1845). Walton house followed in (1835–39), Walton-on-Thames, again he used an Italianate style with a three storey tower over the entrance porte-cochère demolished 1973. Then in (1835–38) he remodeled Sir Roger Pratt's Kingston Lacy, the interiors being his work, as well as the exterior being re-clad in stone. His last major remodeling work was Cliveden again for the 2nd Duke of Sutherland, here he built a new central block after the previous building was burnt down (1850–51), rising to three floors in the Italianate Style, the lowest floor had arch headed windows, the upper two floors have giant Ionic pilasters, he also designed the parterre's below the house, little of Barry's interiors survived later remodeling. The most significant of Barry's designs that were not carried out included, his proposed Law Courts (1840–41), that if built would have covered Lincoln's Inn Fields with a large Greek Revival building, this rectangular building would have been over three hundred by four hundred feet, in a Greek Doric style, there would have been octastyle porticoes in the middle of the shorter sides and hexastyle porticoes on the longer sides, leading to a large central hall that would have been surrounded by twelve court rooms that in turn were surrounded by the ancillary facilities. Later was his General Scheme of Metropolitan Improvements, that were exhibited in 1857. This comprehensive scheme was for the redevelopment of much of Whitehall, Horse Guards Parade, the embankment of the River Thames on both sides of the river in the areas to the north and south of the Palace of Westminster, this would eventual be partially realised as the Victoria Embankment and Albert Embankment, three new bridges across the Thames, a vast Hotel where Charing Cross railway station was later built, the enlargement of the National Gallery (Barry's son Edward would later extend the Gallery) and new buildings around Trafalgar Square and along the new embankments and the recently created Victoria Street. There were also several new roads proposed on both sides of the Thames. The largest of the proposed buildings would have been even larger than the Palace of Westminster, this was the Government Offices, this vast building would have covered the area stretching from horse Guards Parade across Downing Street and the sites of the future Foreign and Commonwealth Office and the HM Treasury on Whitehall up to Parliament Square. It would have had a vast glass-roofed hall, 320 by 150 feet, at the centre of the building. The plan was to house all government departments apart from the Admiralty in the building. The building would have been in a Classical style incorporating Barry's existing Treasury building. 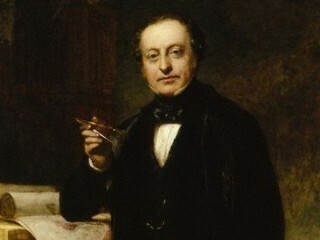 -Barry was elected Associate of the Royal Academy in 1840, and to full membership in the following year. -He was recognized by the main artistic bodies of many European countries, and was enrolled as a member of the academies of art in Rome (Accademia di San Luca) in 1842, Saint Petersburg (1845), Brussels (1847), Prussia (1849) and Stockholm (1850). He was later elected to the Royal Danish Academy of Fine Arts. -Fellow of the Royal Society in 1849. -Awarded the RIBA Royal Gold Medal in 1850. -Barry was knighted in 1852 by Queen Victoria at Windsor Castle, marking the completion of the main interiors of the Palace of Westminster. -After the foundation of the American Institute of Architects in 1857 Barry was elected a member.